Visiting Mirano and seeking for a place to swim? Nice choice! Don't forget to tell us how did it go. 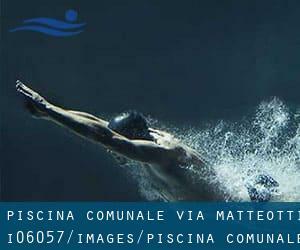 Introducing now Piscina Comunale Via Matteotti swimming pool, an awesome swimming pool sent by a swimmer like you few days ago. Have you visit this pool? Do you work here? Please, contact us if you have info that you think is gonna be beneficial and remember from now on you could now promote every pool just by sharing this page with your buddies or adding comments in the Facebook boxes below. Come on and help this pool to be the first in Mirano! Among all the activities offered by the center, if you are thinking about swimming you may delight in 25 meters x 15 meters, 6 lanes, 1.6 meters depth, 1.6 meters depth, Indoors. If you might want to contact this Swimming Pool, email address and phone number are both number. Updated on 2019 Via Triestina , Mestre , ITALY (Postal Code: 30174). Swimmers like you reported 25 meters x 12.5 meters, 6 lanes, 1.2 meters - 2.5 meters depth, 1.2 meters - 2.5 meters depth, Indoors. Phone number and e mail address are number for this Swimming Pool. Updated on 2019 Via Vittorio Veneto, 22 , San Dona di Piave , ITALY (Postal Code: 30027). Among all the activities offered by the center, if you are considering swimming you will enjoy 25 meters x 15 meters, 6 lanes, Indoors. If you'll want to make contact with this Swimming Pool, email address and phone number are both number. Updated on 2019 Via Resistenza 7 , Portogruaro , ITALY (Postal Code: 30026). Among all the activities offered by the center, should you be interested in swimming you will enjoy 25 meters, 6 lanes, Indoors. If you will need to contact this Pool, email address and phone number are both number. Updated on 2019 Via Penello 5/7 , Mestre , ITALY (Postal Code: 30174). This sports center provides 25 meters x 12.5 meters, 6 lanes, 2 meters depth, 2 meters depth, Indoors. Contact information for this Swimming Pool similar to phone number and email address are number. Updated on 2019 Ca’Bianca , Lido di Venezia , Venice (Venezia) , ITALY (Postal Code: 30100). Swimmers like you reported 25 meters x 13 meters, 6 lanes, Indoors. Phone number and e-mail address are number for this Swimming Pool. Updated on 2019 Sacca San Biagio , Sacca Fisola , Venice (Venezia) , ITALY (Postal Code: 30123). This sports center delivers 25 meters, 8 lanes, 2 meters depth, 2 meters depth, Indoors. For this Swimming Pool, only phone number is number here. Updated on 2019 Via Circonvallazione 53 , Mestre , ITALY (Postal Code: 30174). Swimmers like you reported 25 meters, 8 lanes, 2.1 meters depth, 2.1 meters depth, Indoors. Phone number and e-mail address are number for this Pool. Updated on 2019 Via Arino, 9 , Dolo , ITALY (Postal Code: 30031). Swimmers like you reported 25 meters x 15 meters, 6 lanes, Indoors. Unfortunately we do not have the email address of this Swimming Pool, but we can give you the phone number. Updated on 2019 Giudecca 10 , Venice (Venezia) , ITALY (Postal Code: 30133). This sports center offers 32 meters, Salt Water, Outdoors. For this Swimming Pool, only phone number is number here. Updated on 2019 Parco Albanese , Mestre , ITALY (Postal Code: 30174). This sports center delivers 25 meters, 6 lanes, 1.4 meters depth, 1.4 meters depth, Indoors. Contact information for this Swimming Pool such as phone number and e-mail address are number. Updated on 2019 Via del Bersagliere , Jesolo , ITALY (Postal Code: 30017). Swimmers like you reported 25 meters x 25 meters, 6 lanes, 3 meters maximum depth, 3 meters maximum depth, Indoors. Phone number and e-mail address are number for this Swimming Pool. Updated on 2019 Via Calabria 49 , Mestre , ITALY (Postal Code: 30174). Swimmers like you reported 25 meters x 12.5 meters, 6 lanes, 1.4 meters depth, 1.4 meters depth, Indoors. Phone number and e-mail address are number for this Swimming Pool. Updated on 2019 Via Bramante, 1 , Stra , ITALY (Postal Code: 30039). Swimmers like you reported 25 meters x 16 meters, 8 lanes, Indoors. Phone number and e-mail address are number for this Swimming Pool. Updated on 2019 Cannaregio, 3163 , Villa Groggia , Venice (Venezia) , ITALY (Postal Code: 30121). Swimmers like you reported 25 meters, 6 lanes, Indoors. Phone number and e-mail address are number for this Swimming Pool. Updated on 2019 Via De Pol, 5 , Noale , ITALY (Postal Code: 30033). Among all the activities offered by the center, if you are thinking about swimming you will appreciate 25 meters x 13 meters, 6 lanes, Indoors. If it is advisable to make contact with this Swimming Pool, email address and phone number are both number.